Please join us in Washington, DC for the Annual PTNPA Advocacy & Government Relations Event. PTNPA Members have the unique opportunity to hear from experts on the current regulatory and political landscape and receive updates on key issues facing the nut industry. The event is focused on conducting Congressional Meetings, giving PTNPA Members the opportunity to discuss issues of importance to you and your business. We will also be delivering member product samples along with pamphlets of educational industry information to Congressional offices. If you want to help get nut industry products in the hands of the decision makers in DC, join us as we show them how healthy, safe, far-reaching, and powerful our industry is to the economy and our country. There is no cost or registration fee for PTNPA members to participate in this event. Travel and hotel accommodations are the responsibility of each individual PTNPA member. Interested in prepping? Read this important memo to get a head start. This year's event will be held at the Liaison Capitol Hill, located at 415 New Jersey Ave NW, Washington DC 20001. PTNPA has reserved a block of rooms at a discounted rate of $379/night for PTNPA members. The block will expire on Friday, April 12, 2019. To make your reservations please call 888-513-7445 and use code PTNPA19, or CLICK HERE TO BOOK ONLINE. 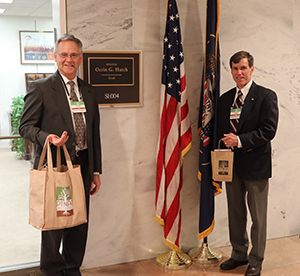 To serve as the "Voice of America's Nut Industry" the PTNPA will be a resource for Congressional Representatives by delivering Nut Industry Facts and Information AND your nut industry products on Capitol Hill. The PTNPA will be assembling the bags - but we need your products to include in the packages that will be delivered to Congressional Representatives. Products should be small packages no more than 3 ounces, and we need up to 300 packages sent to us by April 19. If you are interested in having your products and company information included in this effort, please email membership@ptnpa.org for details. calendars for the below dates and contact membership@ptnpa.org for call dial-in details. Helena Bottemiller Evich is a senior food and agriculture reporter for POLITICO Pro. Before joining POLITICO, Helena spent four years reporting on food politics and policy at Food Safety News, where she covered Congress, the Food and Drug Administration and the U.S. Department of Agriculture. Helena's work has also appeared in the Columbia Journalism Review and on NBC News. Her reporting has taken her to the Louisiana coast during the Gulf oil spill, Arizona lettuce fields, North Carolina hog farms and the occasional presidential turkey pardoning. Martin Hahn focuses on a wide variety of regulatory issues affecting the food and dietary supplement industries. He assists companies in complying with the numerous statutes, regulations and guidance documents implemented by the Food and Drug Administration (FDA) and the Food Safety and Inspection Service (FSIS) of the United States Department of Agriculture (USDA). Martin represents numerous businesses in the food industry including companies that market finished foods directly to consumers, food ingredients, infant formulas, dietary supplements and over-the-counter (OTC) drugs.